Granted, there is still a lot of manual work involved in porcelain production. But robots at premium brand Rosenthal are making a major contribution to the manufacture of high-value products to an excellent standard of quality. Furthermore, automated production systems are ensuring the ongoing competitiveness of the company’s German factories. Rosenthal was founded in 1879. It now employs approximately 800 people and turns out around 13 million items a year at its two production sites in Selb and Speicherersdorf, including porcelain for the laid table and upmarket items for interior decor, gifts, lamps, vases, objets d’art and much more besides. More than 500 design awards are testimony to the exquisite quality of Rosenthal products. But in a hotly contested market, quality alone is not enough to remain competitive over the long term, as Gerhard Limmer, Director of Manufacturing & Purchasing at Rosenthal GmbH, acknowledges: “The design and quality of our products are, of course, the key to our worldwide success. But even we cannot manage without the industry-typical virtues of on-time delivery, dependable quality, speed, efficiency and flexibility. That’s why we have been using robots for some while now and have recently decided to invest in new, high-efficiency production systems equipped with the much more powerful six-axis machines from Stäubli.” The new robots are used in two completely different production processes – high-pressure casting and dry-pressing. In this casting process for the production of square and oval plates, the liquid porcelain slip is pumped into a two-part, porous plastic mold and subjected to high pressure. The water is able to escape through the open pore channels, leaving the porcelain behind in the mold. Subsequent opening of the mold, removal of the item and further post-processing steps now fall within the remit of a robot. The purpose behind the two new high-pressure plants was to have as much work content as possible carried out by the robot. This called for a versatile robot with long reach, high load capacity and high precision. The six-axis Stäubli RX160 proved to be a perfect match. The work spectrum of the RX160 includes taking the item out of the mold, removing the sprue, infrared drying, sponging and returning the article to the production line for further processing. In order that the entire work spectrum can be carried out, the two identical cells are equipped with an automatic tool changing system, by means of which the robot can pick the appropriate gripper for itself. 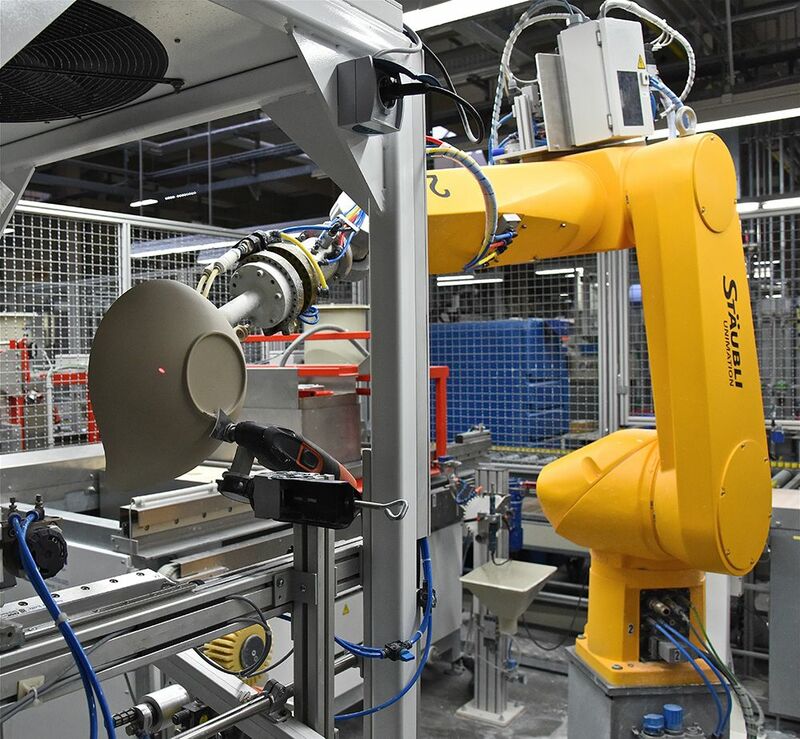 Another Rosenthal production line demonstrates the potential for automation with modern robots in dry isostatic pressing. This method is used to produce flatware. A porcelain granulate is compressed very evenly in a mold under high pressure of around 280 bar. It is a particularly efficient process that offers a number of advantages, including quality improvements, i.e. the plates and servers are exceptionally homogeneous and uniform. The dry-press line uses three identical Stäubli TX90 six-axis machines. They were chosen for their high performance and precision as well as for their enclosed design with high resistance to dust and abrasive particles. All three robots are able to handle an identical range of tasks. In the first step, a robot picks up an unprocessed plate from a rotary table with its vacuum gripper and conveys it to a sanding station. Here, the TX90 guides the plate precisely along the sanding belt until the burr is completely removed. Next comes the two-fold sponging of the outer contour and the rim. The Stäubli robot moves the plate along the rotating sponges with a precisely defined force. 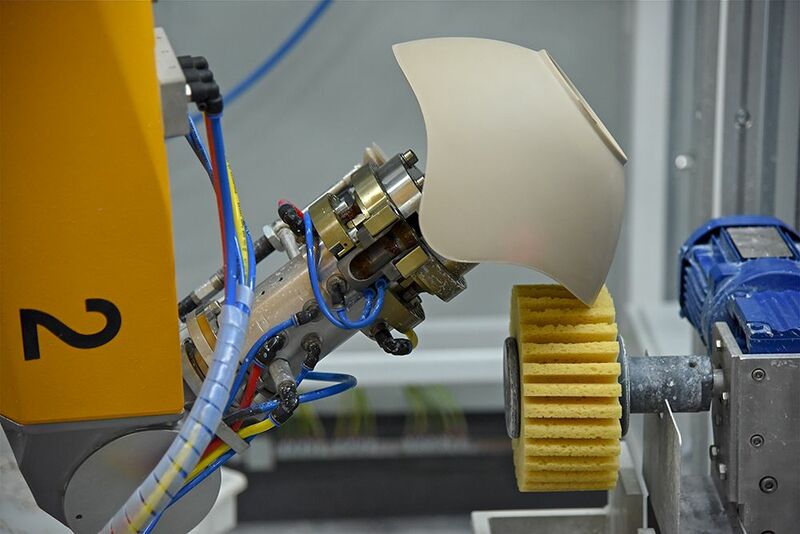 This process is crucial to the appearance of the finished porcelain, which is why the machine’s outstanding path accuracy is of particular importance. After this step, the robot feeds the plate back via the rotary table to the production line where the first firing takes place at a temperature of up to 950°C. The item is then glazed before it finally passes through several hours of smooth firing at a temperature of up to 1,400°C. High-precision Stäubli six-axis TX90s ensure perfect quality of the dry-pressed plates with meticulous sponging. “At present, some 400 different product variants pass through the dry-press line,” adds Weiß. “With batch sizes fluctuating so much, product changes may occur several times a day. This is where the immense flexibility of the robots pays dividends, as the most the operator has to do is to change the vacuum grippers. However, many product variants can be handled with one and the same gripper.” Whenever new product variants are introduced, Rosenthal benefits from the teachability of the robots as well as from the option of offline programming. Depending on the product variant, between 500 and 1,000 units leave the dry-press line per shift. The use of modern, high-performance robotics has revolutionized production at Rosenthal. Whereas the limiting factor in terms of output used to be the robots, today it is the presses. This has had an enormous impact on productivity which, thanks to state-of-the-art automation, has increased by up to 20 percent. 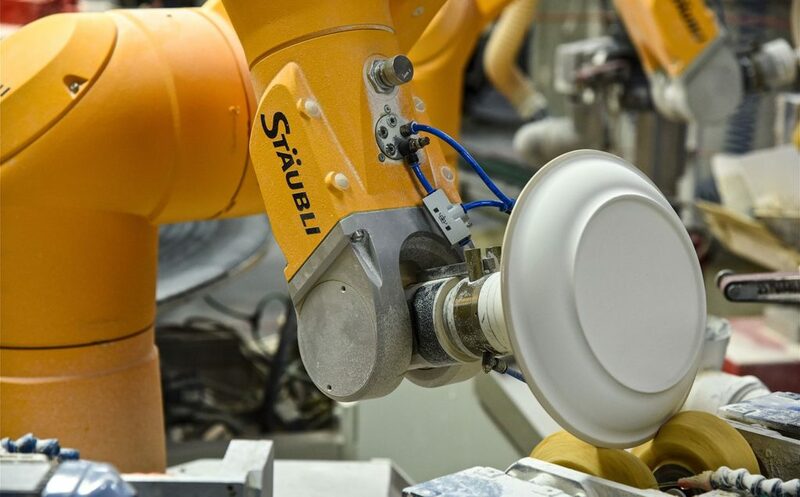 With the superior Stäubli robots and their excellent path accuracy, we now have the automated processing of much more sophisticated porcelain products with more complex shapes. It is precisely this passion for perfection and the realization of ever newer quality and design standards that will secure the competitive edge of our company and of the production sites in Germany in the future.